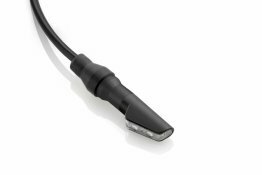 The Rapid Bike EVO ECU Piggyback Tuning Module includes the Rapid Bike EVO module, USB cable and model specific wiring harness. The Rapid Bike EVO kit is the perfect tuning solution when you add an exhaust and/or air filter to your motorcycle. 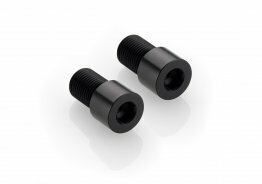 This allows you to easily get the best performance and reliability out of your bike. 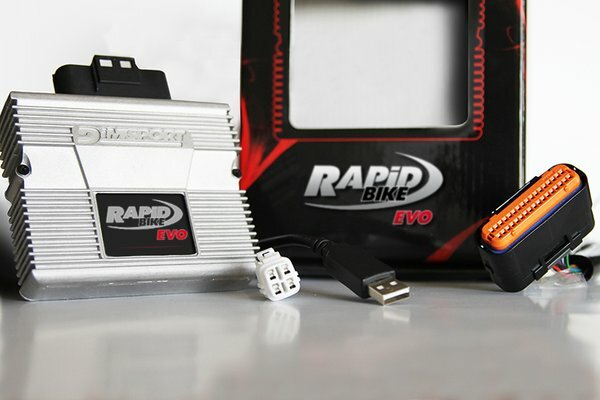 Rapid Bike EVO is a completely automatic tuning solution. The piggyback unit installs with all plug-n-play stock connectors. Once the unit is installed, the Auto-Adaptive feature monitors your air/fuel parameters and applies the necessary adjustments AS YOU RIDE. No need to connect to your computer, mess with software, or make any changes. JUST RIDE. The Rapid Bike unit handles all the tuning. 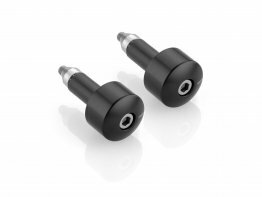 Perfect for stock bikes, slipon exhausts, full systems, and other common motorcycle upgrades. Because this unit simply piggybacks the ECU, the unit can be removed at any time, and does not make any permanent changes that may affect the factory warranty. RAPID BIKE EVO module manages up to 8 injectors and modulates the signal up to two O2 sensors (up to 2 lambdas). 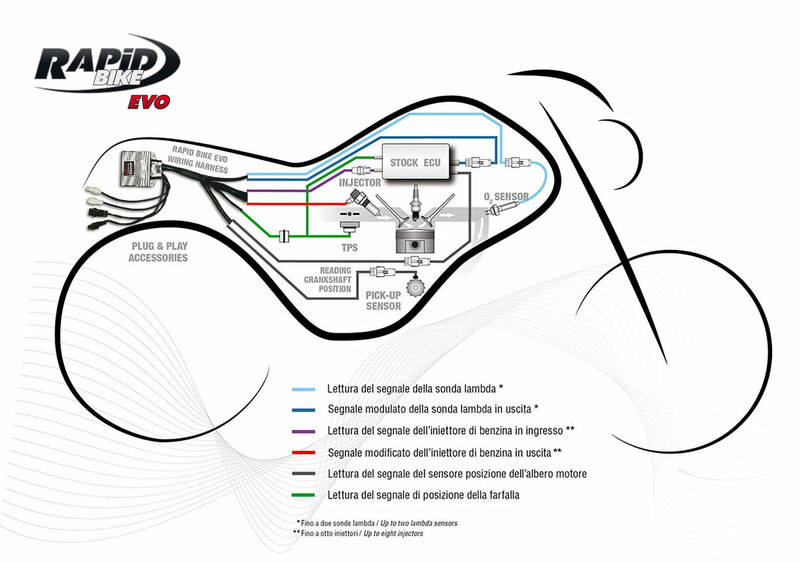 The purpose of the O2 sensor (lambda) modulation is to prevent the stock ECU from recognizing the adjustment applied by the RapidBike module to the injection map without any further attempts to re-set the stock parameters matching the criteria fixed by the restrictive exhaust gas emission laws. The Rapid Bike Evo module’s most important benefit is the Auto-adaptive feature. This offers the ability to automatically correct the injection map by reading the signal of the stock O2 sensor (lambda) and making the adjustments automatically while riding the bike. Modulating the stock O2 sensor (lambda) signal is a technology far more advanced than the so called “O2 sensor eliminator” (or any other similar device used by the competitors) since they send a static/constant signal which is in conflict with the typical behavior of the lambda sensors, therefore causing the main ECU to perceive such a constant signal as a mistake to be corrected. The Rapid Bike Evo module is can be moved to your next bike and simply sent back to Rapid Bike for a map reflash (assuming the a tune is offered for that bike). All you would need is the proper wiring harness (available from Rapid Bike). This essentially means this could be the last tuning module you ever buy! 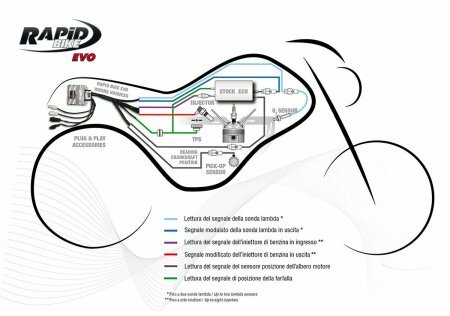 On most models, the Rapid Bike Evo unit can remove the speed limiter and to increase the rpm limiter up to 1000 rpm over stock rev range and also has an accelerator pump feature. QUICK SHIFT READY: Rapid Bike Race and Rapid Bike Evo systems are quick shift ready. All you need is the additional Rapid Bike quick shift sensor. Note: All Rapid Bike products are designed for closed-course competition use. I like this better than the ECU reflashes, because this isnt permanent.